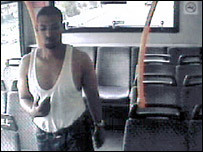 Four men have been found guilty of plotting to bomb London's transport network on 21 July 2005. Muktar Ibrahim, 29, Yassin Omar, 26, Ramzi Mohammed, 25, and Hussain Osman, 28, were convicted at Woolwich Crown Court of conspiracy to murder. 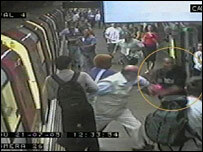 The men had tried to detonate rucksacks laden with explosives on the Tube and a bus, killing themselves and passengers. But the bombs failed to go off sparing the city a repeat of the horrors of the 7/7 attacks, two weeks earlier. The events of 21 July followed a fortnight of apprehension for Londoners and a period of high alert for emergency services. Widespread chaos and panic were brought to the capital, with the London transport network brought to a standstill. The jury heard the four defendants claimed the bombs covered in shrapnel were fakes, and their actions had been intended as a protest against the war in Iraq. 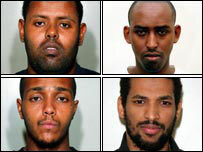 After a six-month trial, the jury unanimously found Ibrahim, Omar, Mohammed and Osman guilty of conspiracy to murder. Jurors will continue their deliberations on the two other defendants, Manfo Kwaku Asiedu, 34, and Adel Yahya, 24, on Tuesday. The judge, Mr Justice Fulford QC, has said he would accept a majority verdict of 10 to 2. The guilty four, who were all born in East Africa and came to the UK in the 1990s, stocked up on large quantities of hydrogen peroxide from hairdressing suppliers, ahead of 21 July 2005. Omar's eighth-floor flat in New Southgate, north London, was turned into a bomb factory. The devices - to be carried in rucksacks - were made of chapati flour and a similar hydrogen peroxide mixture used by the men behind the 7 July attacks in which 52 people died. Mohammed targeted a train at Oval station in south London, Omar was on board a train at Warren Street in central London and Osman travelled on a Hammersmith and City line service to Shepherd's Bush in west London. Ibrahim, the prime mover in the conspiracy, boarded a bus in Shoreditch, east London. The jury heard that had the suicide bombs detonated properly, dozens of people would have been killed. The attacks, and the subsequent escape of the four guilty men, sparked the UK's largest ever manhunt. Their movements were captured on thousands of hours of CCTV film, with seven hours worth proving to be crucial evidence. One of the plotters, Mohammed, left a suicide note intended for his girlfriend and their two young children urging them to "rejoice in happiness". He and Ibrahim - who was believed to have undertaken jihadi training in Pakistan - were captured a week later after armed police surrounded a flat in west London. Omar was arrested in Birmingham after travelling there disguised as a woman in a burka, while Osman was detained in Rome and extradited back to Britain. But in their efforts to track down those behind the attempts, the police mistook an innocent man for one of the suspects. Jean Charles de Menezes, an electrician from Brazil, was shot dead at Stockwell Tube station a day after the failed attacks. It later emerged that the defendants had been photographed by police surveillance officers while on a 2004 camping trip in the Lake District. Nigel Sweeney QC, prosecutor, had told the trial the men chose a date "just 14 days after the carnage of July 7". The trial heard evidence that the conspiracy "had been in existence long before the events of July 7" and was not a "hastily-arranged copycat" operation. Mr Sweeney said: "The failure of those bombs to explode owed nothing to the intention of these defendants, rather it was simply the good fortune of the travelling public that day that they were spared."